Stage West celebrated its 40th anniversary Wednesday with a gala – and the announcement that the Fort Worth theater will be expanding with new performance spaces and a redesigned cafe. Art & Seek’s Jerome Weeks reports it’ll all cost $3 million – but the theater has already raised more than half of that. Stage West is about to become a transformative cultural resource in Fort Worth. It’ll be able to foster smaller theaters and music groups by renting spaces to them, and it’ll increase its own revenue possibilities when its current lobby cafe doubles its seating to 125. When the expansion is complete, Stage West will be the only company in Tarrant County with four performance spaces. That includes its main stage with 144 seats and a new, flexible studio space next door that can seat up to 200. There’ll be a tiny rehearsal hall and they’ll all share the current lobby cafe, which can also be used for small shows. In 1930, the yellow-brick building on West Vickery Boulevard was a bus garage. In 2007, it became the sixth home for Stage West. The company had been bouncing around Fort Worth until the theater’s late founder Jerry Russell settled his theater there. Under his successor, executive director (and Art&Seek Spotlight artist) Dana Schultes, Stage West has almost doubled its budget. Under Schultes, recent productions including ‘Bootycandy,’ ‘The Nether,’ ‘The Octoroon‘ and ‘A Doll’s House, Pt2’ have undeniably ramped up the theater’s production quality. These have been some of the more daring, highly-praised shows in North Texas the past two season. Last year, Stage West became one of the very rare North Texas theaters to purchase its own home. Yet this new “Setting the Stage for the Future” campaign is actually the theater’s first-ever, community-wide fundraising effort. (Fort Worth, Texas) Stage West marked 40 years in the city with a grand dinner and festivities highlighting its many accomplishments, on February 27, at the Fort Worth Club. Since its founding in 1979 the theatre has presented over 300 plays to audiences that totaled more than 650,000 patrons over the years. The celebration culminated in an announcement that Stage West had just completed the four-month silent phase of a planned, three-year $3 million comprehensive campaign. The surprise declaration was made by former State Senator and the daughter of the theatre’s founder, Jerry Russell, Wendy Davis. She delighted the audience with the news that more than one-half of the goal at $1.68 million had been reached! 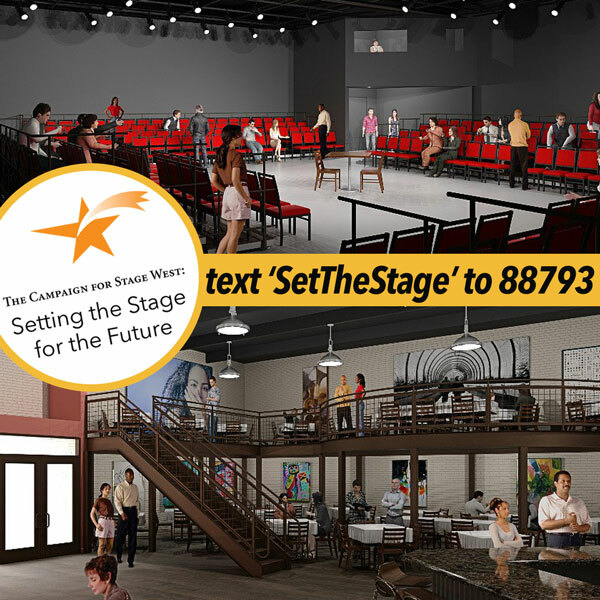 The Campaign for Stage West: Setting the Stage for the Future is the culmination of a series of important accomplishments. The most consequential was the acquisition of its home theatre at 821 West Vickery at the beginning of 2018. The building, which was originally built as a bus garage in 1930, was the sixth site in Fort Worth from which the company produced plays. Other factors that encouraged the board to conduct a campaign included the doubling of its annual philanthropic income during the last four years. While its annual revenue budget crossed the $1 million mark. Stage West had also built a $200,000 reserve fund, and began an effort to create an endowment named for Jerry Russell. In addition, the theatre has gained increasing recognition for the quality and challenging nature of its productions. Most recently, TheaterJones’ Mark Lowry named Stage West the outstanding theatre of 2018 based on its productions last season of Octoroon and HIR. “We have had a nice run of good fortune,” said Dana Schultes, Stage West’s Executive Producer, “and it encourages us to think bigger. Success in this campaign will help Stage West move to a new plateau of excellence leading to our goal of becoming a landmark theatre in our region. Thankfully, we have been most encouraged by the response to the campaign among our board members and the friends we have reached in the first four months of the campaign”. The focus of the campaign is to refurbish the main space, as well as to create a second theatre, a redesigned rehearsal hall, an expanded café, new dressing rooms for both theatres, and other improvements planned to make the spaces work better. In addition, the $3 million goal includes the monies required for operational needs during the three-year span of the campaign. The 40th Anniversary Gala hosted 200 supporters, including some who attended Stage West’s initial production of Edward Albee’s A Zoo Story in 1979. The guests were entertained by award-winning magician, Trigg Watson, and by musical medleys arranged by Cherish Robinson from the many shows performed at Stage West. In addition, the evening included a buffet dinner as well as silent and live auctions.